Want to learn more about social media marketing? Consider enlisting in the Certified Digital Marketer (CDM) program of the International Institute of Digital Marketing (IIDM). Know what it's all about here. In his column in The Next Web (thenextweb.com) last December, serial entrepreneur and business columnist Scott Gerber named 12 “IT” social and content careers to watch for this year. The job titles, which include Google+ Expert, Instagram Consultant, Content Marketer, Augmented Reality Social Manager, Social Growth Hacker, Director of Content,were never heard of five years ago, but today, those have become enviable jobs. This just illustrates how fast social media industry is growing. “The social media industry is growing faster than traditional learning institutions can re-align their programs,” says Hans Roxas-Chua, one of the Program Directors of the Certified Digital Marketer (CDM) Program of International Institute of Digital Marketing (IIDM). “That’s why we see it apt to come out with a program such as ours with comprehensive online courses like the Social Media Marketing Specialist track ,” adds Hans. The program jumpstarts the learning curve of the students through its global team of lecturers from prestigious organizations like Google, Brandtology, Pure Performance Communications, DIGIT (DM9 JaymeSyfu’s digital outfit), Geiser Maclang, Havoc Digital, and MCCANN’S MRM Worldwide, to name a few. For utmost convenience, Webinar sessions are recorded and uploaded to the CDM Program’s Learning Management System for easy viewing or review. To simulate real world scenarios, caselets will be given to students to work on. A caselet gives a brief situation or background and a specific tool or technique that should be used by the student to solve the problem. Two of the students’ best caselets will be discussed and dissected during the next live lecture online. All in all there are over 100 learning modules and case studies covering various social media strategies that CDM-IIDM students will study including award-winning social media marketing campaigns from the region as well as the world. “Upon completion of the whole track, students will earn a specialist title from the Certified Digital Marketer Program of the International Institute of Digital Marketing, recognized by over 10 global organizations,” says Hans. One of the speakers will be a prominent Social Media and Digital PR expert Dierdre Breakenridge, CEO of Pure Communications whose clients include Hershey’s, JVC, Marketwired and Siegel+Gale among others. She is also the author of the book Social Media and Public Relations: Eight New Practices for the PR Professional and an avid blogger on PR 2.0 strategies. Diedre will discuss: Creating your brand’s online voice and your content plan for Social Media. She will also critique the top three student assignments as part of the Social Media Marketing track. 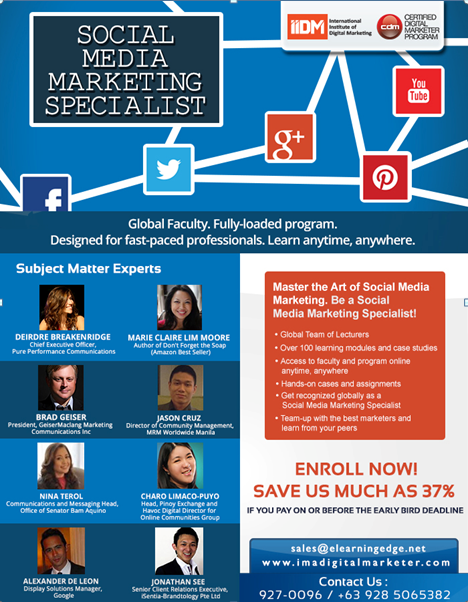 For more information on The Social Media Marketing Specialist program, log on to www.imadigitalmarketer.com or look for Margie Flores (Marketing and Sales Manager) through contact info: marketing@elearningedge.net /+639 28 506 53 82, (02) 927 00 96.